30 m a s s a g e & b o d y w o r k n o v e m b e r / d e c e m b e r 2 0 1 8 MINDFUL MONEY best practices Don't Let Money Stop You By Jennie Hastings We are living in a culture fueled by consumerism. We are told by the advertising industry that our lives are lacking and we need new products and services to be successful and happy. We easily fall into the trap that happiness is something that can be found outside of ourselves. But looking outside of ourselves for happiness is the best way to suffer. Why? Because everything is always changing. Even if we can find happiness for a brief time with an external object, soon our minds will begin to desire something else and we will again be in a state of lack. When we turn our attention inward and begin to identify ourselves with the eternal, unchanging consciousness that lives through us, we automatically become happier and more fulfilled. Slowing down, taking time to meditate, spending time in nature, preparing and sharing a meal with family and friends—these are the activities in life that will help us connect with the eternal. In this state of connection, we are not in a state of lack. We are complete and whole. From this place, we begin to feel wealthy as we notice all the life-sustaining and beautiful aspects of life that are given to us on a daily basis. Fresh air, clean water, a beautiful sky, smiles and kindness, space and time to unfold our minds. Of course, there is a minimum amount of money and material objects needed to live life. We need food, shelter, health care, education, and a level of personal safety and security that requires money. There is nothing wrong with standing up for yourself and asking for this, whether that be from an employer or from your clients. It is not greed to want to stabilize your financial life and thrive. 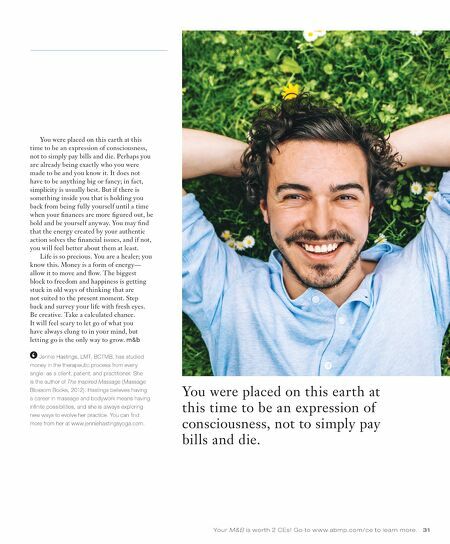 Money mindfulness asks that we become realistic about the amount of money needed in our lives and take direct action to create sustainable ways to attain it. It asks us to release our ego and our worries about what other people will think when we post our prices or ask for a raise. It asks us to show up at the level we want to be compensated for. Money mindfulness also means learning how to feel content and abundant with our financial choices. It is not about attaining a certain number of things or keeping up with the Joneses. In fact, learning how to concentrate on a feeling of enough-ness may show us how little is actually needed to feel good. This is a very liberating state to be in. As we begin to detach our inner state of feeling from the external world, everything that happens becomes easier to deal with. We become stabilized mentally and spiritually even while the physical world changes around us. This will be my final installment of Mindful Money. It has been a privilege and a pleasure to share these ideas over the last few years. Becoming mindful of money and my relationship to it has helped me immensely in my own life, and I hope this column has also helped you recognize any unconscious beliefs about money you carry. The idea I want to share with you now, as a final note to this Mindful Money journey, is to be who you are meant to be now. Don't let money stop you. DON'T WAIT If you are reading this magazine, you are probably much more affluent than you even allow yourself to recognize. You may not be part of the 1 percent; and compared to people you see in the media every day, you may not have a lot of money. But the fact that you are a professional massage therapist or bodyworker, living in North America, a member of ABMP, that you can read, and have time to invest in your personal development, means you have a lot of opportunity and freedom in this lifetime. Use it. Don't wait. Don't wait until you have paid off your student loan, or mortgage, or credit card debt. Don't wait until you have been practicing for a certain length of time. Don't wait until you get that inheritance, or that spouse, or until someone discovers you. Be who you are meant to be now. Only you know what that is. Maybe it has nothing to do with massage and bodywork. Maybe it means you feed people. Maybe it means you sing, or write, or dance. Maybe it means you start praying out loud so people can hear. Only you know, and you cannot let money get in the way.